Posted on 14, June 2018 by EuropaWire PR Editors | This entry was posted in Internet & Online, Marketing, News, Spain, Travel, United Kingdom and tagged accommodation, airport transfer, Balearic Islands, bargain holiday, budget, budget travel, bus, Canary Islands, car rental, cheap flights, cheap holiday, Costa Blanca, Costa del Sol, Costa Dorada, Costa Tropical, eating out, family holidays, family-friendly activities, family-friendly holidays, Gran Canaria, holiday, holiday purchases, holiday spending budget, Ibiza, Lanzarote, last minute family-friendly holiday rentals, last-minute budget holiday, local holiday expenses, Spain, Spain-Holiday.com, Spanish holiday rental website, Spanish holiday resorts, Spanish summer destinations, spending money, Summer Spending Report, taxi, Tenerife, theme park, travel, travel industry, travel industry news, travel tips, travel trends, Travel Trends Report, vacation, watch the World Cup on your holiday, water park. Bookmark the permalink. Top tips how to make your holiday spending budget stretch further in the different Spanish holiday resorts. Latest Summer Spending Report compares everyday holiday purchases in the most popular Spanish summer destinations. Get top tips how to make your holiday spending budget stretch further in the different Spanish holiday resorts. Want to watch the World Cup on your holiday where beer is less than 90p (€1)? Head to the Costa Tropical in the south. Gran Canaria tops the list of overall best value destinations in Spain for transport, eating out, food shopping and things to do, with Lanzarote and Tenerife also featuring in the Top Five. Ibiza is the most expensive Spanish holiday destination. Prices for eating out and food shopping are on average 40% more expensive than the rest of Spain. MALAGA, Spain, 14-Jun-2018 — /EuropaWire/ — If you’re looking for a last-minute budget holiday this summer, then Spain is your best bet in Europe. Spain is a hot favourite holiday spot for Brits with more than 19 million Brits choosing to holiday there in 2017. Cheap flights and accommodation don’t necessarily mean a cheap holiday; varying prices of everyday local holiday expenses are playing a far bigger role in bagging a bargain holiday in the sun. 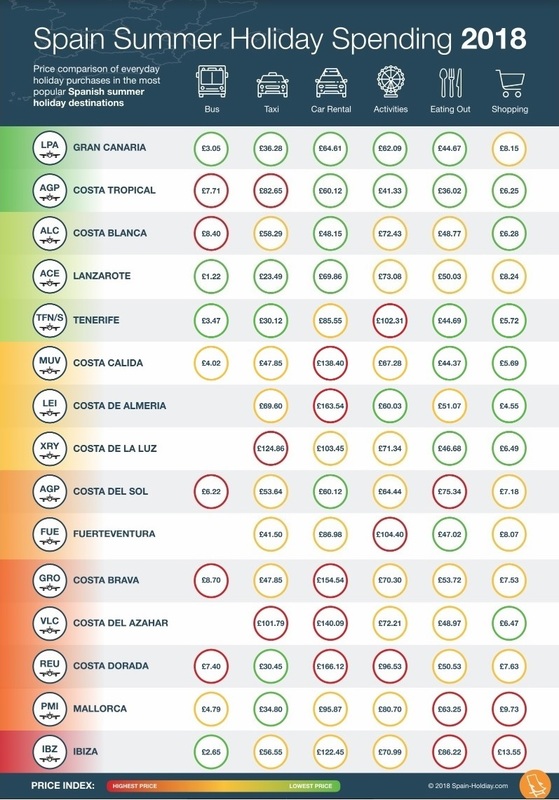 Leading Spanish holiday rental website, Spain-Holiday.com, has compiled a Summer Spending Report [read full report at https://www.spain-holiday.com/campaign/summer-spending-report] that reveals the best value and most expensive destinations for Brits to take a break in Spain this year and the results might surprise you. The Top 3 best value destinations, where your euros will stretch further, are Gran Canaria, followed by the Costa Tropical and the Costa Blanca. According to the annual Summer Spending Report, the island of Gran Canaria is one of the cheapest destinations based on airport transfer by bus, taxi and car rental rates, as well as eating out, and family-friendly activities such as a day at a water park, or a theme park. In contrast, the three most expensive destinations are the Mediterranean islands of Ibiza and Mallorca followed by the Costa Dorada. The data, compiled by the holiday rental website, Spain-Holiday.com, compares the price of everyday holiday expenses such as airport transfer by bus, taxi or renting a car, as well as typical family-friendly activities and eating out and food shopping. For those staying in self-catering accommodation, one of the biggest, unavoidable expenses tends to be getting from the airport to the accommodation. The cheapest way to get from the airport is normally by public transport which costs between £1.22-£8.70 (€1.40-€10) for an adult single, compared to a taxi fare of between £23-125 (€27-144). Overall the Canary Islands of Gran Canaria, Lanzarote and Tenerife are ranked in the top five best value destinations with Lanzarote the cheapest for both bus and taxi airport transfer as well as being in the top five for overall value. Another surprising holiday budget tip includes comparing car hire prices to bus fares from the airport. For example, a family of four holidaying on the Costa Blanca can hire a car for a week at Alicante airport for less than the price of the return bus tickets. 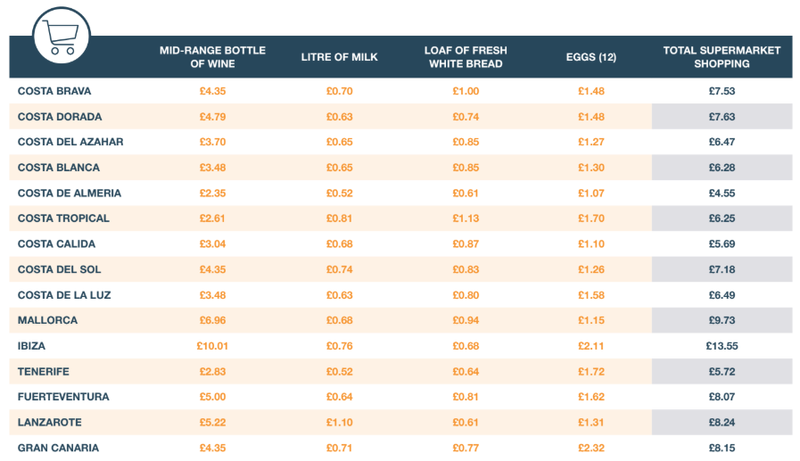 The study compared costs of items such as eating out and a basket of everyday staple supermarket purchases. A three-course meal for two people in a mid-range restaurant sharing a bottle of house wine and a bottle of water, including tax and service will set you back an average of £30 (€35). Budget savvy travellers should head to the coastal resorts of Almuñecar, Motril, La Herradura or Salobreña on the rugged Costa Tropical. The relatively unspoilt Costa Tropical is in the top three best value summer holiday destinations in Spain, according to the Summer Spending Report 2018. 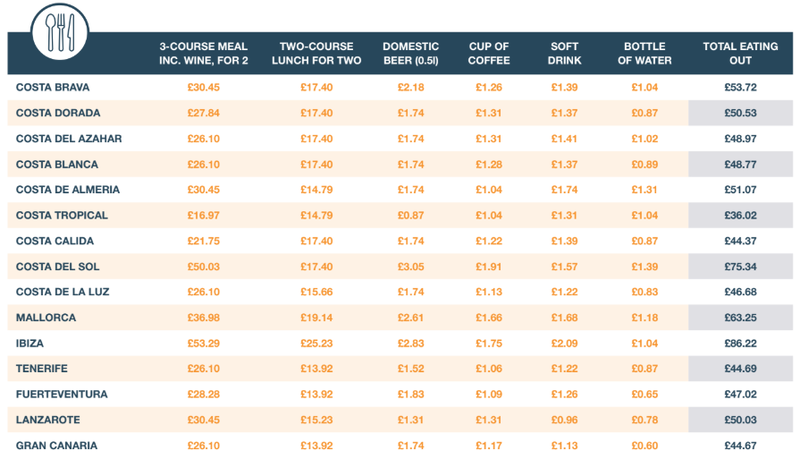 Eating out and food shopping is 30% cheaper than average prices in popular tourist resorts Spain, and a whopping 58% cheaper than eating out and food shopping in Ibiza, which is the most expensive Spanish summer destination. World Cup fans heading to the Costa Tropical will be celebrating the fact that a cold domestic beer in a bar is the cheapest in Spain at only 87p (€1). In comparison, holidaymakers heading to the Costa del Sol can expect to pay the highest price for their “pint” at more than three times the price at £3.05 (€3.50) for a half litre. Day trips and things to do are one of the biggest expenses of a summer family holiday. The average price of a day out at a theme park or water park, for a family of four, is £74 (€85). Once again, the Costa Tropical tops the list of best value destinations for family-friendly activities, costing less than £50 for a family pass to a main attraction. Surprisingly, Ibiza has the cheapest water parks costing from just £65 (€74) for a one-day family pass. For late bookings this summer, Spain-Holiday.com offers fantastic value last minute family-friendly holiday rentals [https://www.spain-holiday.com/Spain/holiday-rentals/lastminute] in Spain, the Balearic Islands and the Canary Islands.